Within Temptation's newest album Resist pushes musical boundaries but is thematically vague. The two biggest names in European symphonic metal, Nightwish and Within Temptation, approach the problems and opportunities of new albums in rather different ways. Nightwish became famous for Tarja Turunen's operatic vocals, but has since continued making excellent, consistent, exciting music with two successive singers, Anette Olzon and now Floor Jansen, because the band's main composer, Tuomas Holopainen, has successfully developed a house style, so to speak (best observed in tracks like "Ever Dream", "Nemo", "Endless Forms Most Beautiful", and "Storytime".) You can pretty much always tell it's a Nightwish song, even when it incorporates elements of pop ("Amaranth"), folk ("My Walden"), gospel ("Meadows of Heaven"), or thrash metal ("Master Passion Greed"). The lyrics will feel similarly unified, again due to Holopainen's tendency to control much of the songwriting process: while bombastic and occasionally too lofty, Holopainen's lyrics are poetic and not constrained by scansion or perfect rhymes. On the other hand, the unifying element of Within Temptation's varied discography is Sharon den Adel's voice and its incredible atmospheric range. It's not the most polished or technically strong voice—that honor belongs to Floor Jansen, now of Nightwish—but Sharon den Adel is capable of drawing out incredible emotion in each register, whether it's a tender falsetto or a throaty bellow. Each Within Temptation album, then, is basically a chance to try out a different style, knowing that den Adel will continue to draw listeners. The Silent Force (2004), often considered the band's most popular album, uniformly goes for the soft side of Within Temptation's sound; most of its songs are gentle, emotional ballads with epic orchestral backing. The band's best material is (somewhat characteristically) present in that album's bonus tracks. "Say My Name", a piercing, mournful song about a loved one with memory loss, is killer, and den Adel's voice sounds wobbly and on the verge of tears. Sometimes that desire to keep things fresh pays off in unexpected ways. Within Temptation's 2011 The Unforgiving, a cheesy whopper of a concept album, was pure corny eighties throwback and nothing but enjoyable. "Iron" and "Sinead" are just some of the catchiest songs they've ever released, and you don't even have to really like the album's concept to enjoy them. Another great song from that era, "The Last Dance", is, again, in the bonus material, but on the whole it sounds as though the band had a heck of a time making The Unforgiving and developing all of its tie-in comics and films. 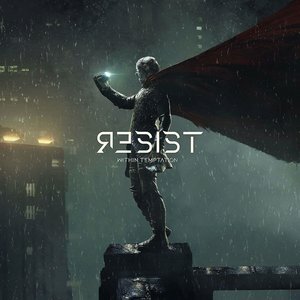 Unfortunately, then, I can't begrudge Within Temptation for wanting to expand their repertoire with electronic elements, as they have on their newest album Resist, even if I personally don't love the results. Resist is a step up from the unlistenable Hydra, which, in that same adventurous spirit, poorly incorporated rap in one of the tracks ("And We Run"). Coming from what seems like intense personal tragedy and stress for den Adel and other members of the band, it is definitely the sound of a band that ready to keep exploring and pushing musical boundaries. Resist does include some material that harkens back to the band's history, even if that institutional memory seems to extend no further back than The Silent Force, meaning that the fantasy-inspired Mother Earth (2000) will probably never see a resurrection in successive records. "Trophy Hunter", Resist's closing track, sounds like they beefed up and repurposed melodies from "A Dangerous Mind" (a bonus track from The Silent Force), while the meant-to-be-rousing crowdpleasers "Raise Your Banner" and "The Reckoning" sound the most like material from The Heart of Everything (2007), but with added glitchy, modern beats. More enjoyable is "Mad World", which has the strongest hook and a pumping, energetic beat, and "In Vain", which has an appealing vocal melody. These two are probably the best of the record. The electropop "Supernova", with its space-related metaphors for love, is ripe for a million new Doctor Who fan videos (if that's still a thing people do in 2019). I found myself missing the usual breathy, solemn ballad or two that Within Temptation excels at delivering: The Heart of Everything has the devastating three-punch of "Forgiven", "Frozen", and "All I Need". The Silent Force has "Pale", "Memories", "Somewhere", and the "Swan Song" and "Say My Name" from the bonus material; even the eclectic Mother Earth has the charming "Our Farewell". As I consider the track list, I have to wonder if perhaps Resist would have been better as a more streamlined, shorter EP: pick either "The Reckoning" or "Raise Your Banner", slide in "In Vain", "Mad World", "Trophy Hunter", and add in "Supernova" as a bonus track. There are just too many songs that feel skippable for the entire album to feel cohesive. "Endless War" borrows the stuttering pulse of electronic music to mediocre effect, while "Holy Ground" feels like filler and "Mercy Mirror" is overwrought. Resist does start off on the wrong foot both musically and thematically, and it ends up coloring the experience of the album in its entirety. Perhaps it's a case of "resistance fatigue", but for a band to call an album Resist, and to have generic lyrics about tears and blood and fighting the war for freedom, rings incredibly hollow—almost on the level of creative inertia displayed by the last few Muse albums. If you're going to write a political album, you can't do it in half-measures, which is why there isn't an infinite number of good political concept albums. Green Day's American Idiot is now a bit dated, but also incredibly specific in its political targets, meaning that it's a product of its time and a valuable cultural artifact, reflecting how musicians were responding to the Bush administration and the War on Terror. Within Temptation is a Dutch band, so I'm not expecting them to follow a similar path to Green Day, but there's certainly enough political turbulence going on in the Netherlands that could be addressed musically. You have to turn to an interview (in French) with den Adel to understand some of the thought process behind songs like "The Reckoning" and "Raise Your Banner". If den Adel is concerned about privacy, advertising, data, and democracy, as she indicates in the interview, it certainly doesn't come across in Resist, where the calls to arms sound like vague slogans. When she says she wants these songs to "raise awareness", you can't help but wonder how and why.